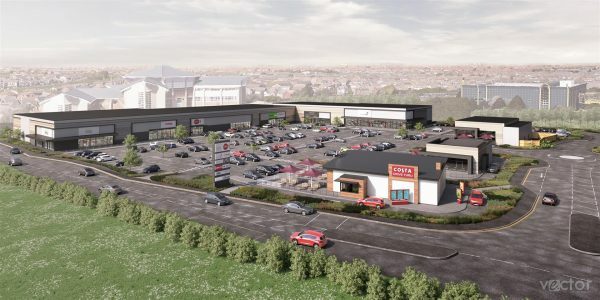 Our Manchester office is acting as lead Designer, Design/Planning/construction from inception through to completion for KIER Property on the Norcross Lane Retail Park in Thornton-Cleveleys. Following planning approved early 2018, we are currently at RIBA stage 4 Tender Design utilising a full REVIT design team model. The development site consists of brownfield land once occupied by pre-war office blocks which have recently been demolished, and was once part of the larger site containing offices including Governmental departments and a data centre. The new KIER proposal, in line with an outline approved masterplan strategy, incorporates a mix of retail and restaurant uses comprising 70,000sqft of A1 Food and Retail accommodation in a mix of unit sizes together with a coffee drive thru and fast food outlet totalling 3,700sqft of A3&A5 Use. The scheme will include a contemporary mix of cladding, shopfront glazing and canopy design with strong pedestrian links to the parking located in front of the terrace design. Start on site is envisaged for late Spring 2018.